Where do I use my Virgin Mobile voucher code? With Virgin Media’s flexible 4G pay monthly plans you can enjoy data rollover which allows you to keep your unused data each month. You can also enjoy data-free messaging on WhatsApp, Facebook Messenger and Twitter as well as F-Secure SAFE internet security free for 12 months. Virgin Mobile also allows you to change your 4G plan up or down every month and add great value phone insurance to your plan. If you opt for a SIM only plan you can take your pick from tons of discounted SIM cards, specifying how many minutes, texts and how much 4G data you want to add to your card. If it’s a pay as you go deal you’re looking for you can choose from tons of affordable mobile phones from top brands like Nokia, Alcatel and IMO. Starting from just £19.99 with a £10 top-up included, you can get yourself one of Virgin Media’s 3G JAM Pack tariffs that gives you great pay as you go rates and rewards you with loads of minutes, texts and data when you top up with £10 or more. Get started today, browse through loads of phones, devices, plans and deals and find the best option for you, at an affordable price. If you’re already with Virgin Mobile then you can enjoy loads of handy services as well as great plans and affordable devices. Virgin Mobile can help you keep your number even if you switch your phone, you can also learn how to upgrade, how to recycle your old phone and how to get help with your mobile, especially if it’s lost or stolen. Virgin Media also offers a freestyle early upgrade. So even if you’re still under contract, you can easily upgrade your phone and, with Freestyle Trade Up, cash in your old handset to lower the cost of a shiny new one. 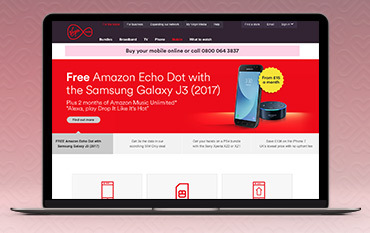 All you have to do is have a chat with Virgin Media to get your current handset valued, choose your new phone and upgrade to a new 24-month contract and then wait to receive your new phone and packaging to return your old phone for free. Virgin Mobile has a latest deals section where you can find tons of great offers on an array of Virgin Mobile plans. In this section, you’ll find the UK’s lowest priced 100GB SIM only plan, discounts on great phones from big brands like Sony, discounts on the latest iPhones and AirPods, free gifts including the Sony Smart Speaker worth £169 and free various Android tablets. All these deals change regularly so check back every so often to find new discounts on Virgin Mobile’s plans and devices. Virgin Mobile has its own mobile WiFi device - your easy and instant WiFi hotspot. The wireless mobile WiFi device is a tiny portable wireless internet hub that uses a 4G mobile phone signal to connect to the internet. And because it’s wireless, you can connect up to 10 devices at the same time, such as your laptop, tablet, desktop computer or mobile. So whether you’re in a cafe, in the park, at your desk, in your car, on a bus or at a client’s office, you can easily connect to the internet. The mobile WiFi device doesn’t require any USB ports or cables, it doesn’t need extra drivers, software or system requirement issues and supports download speeds of up to 150Mbps and upload speeds of up to 50Mbps. How much is it to buy extra data? When your monthly data allowance runs out Virgin Mobile charge you £3 extra per 1GB per day to carry on using it. These excess charges apply until your monthly allowance refreshes on your next billing date. Virgin Mobile gives you the freedom to change your plan each month. That means you can move up to enjoy more minutes and data, or move down to reduce your monthly cost. If you fancy upgrading your plan, give the team a call on 789 from your Virgin mobile phone, or 0345 6000 789 from any other phone.